The historical monuments in Hyderabad built before 1947 are quite popular among tourists to South India. Equally popular are the tourist spots that were built after 1947 in Hyderabad. Here’s a list. Constructed with white marble, Birla Mandir is located on the hill called Naubat Pahad. It offers a grand and an excellent view of the city. It looks amazing in the evening as it is well lit and illuminated. 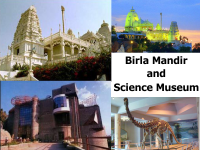 Birla science museum is adjacent to Birla Mandir. An important feature of this museum is Dinosorium with fossils of 160 million years old “Kotasaurus Yamanpalliensis”. The museum also has a collection of fossils of dinosaur eggs, fossilised tree trunks and marine shells. A popular visited destinations in Hyderabad, Nehru Zoological park is located near Mir Alam tank. It was established in the year 1963 and is named after the first Prime Minister of India, Jawaharlal Nehru. The zoo houses animals like Blackbuck, Spotted Deer, Peafowl, Crocodiles, Indian Rhino, Gaur, several primates, Bears, Deers, Antelopes, Asiatic Lions, Royal Bengal Tigers, Panthers, Birds, Reptiles, Giraffe, Iguanas, Chimpanzee, etc. This entry was posted on Jan 2014 at 5:32 PM	and is filed under Visiting Hyderabad. You can follow any responses to this entry through the RSS 2.0 feed. Your Feedback Matters!